First-time homebuyers with an eye on northwest Calgary have a new opportunity in Sage Hill. The first Sage.Stone residents are in the midst of unpacking their belongings in their new townhomes. Brian Kernick has been biding his time, waiting for the right opportunity to move into Calgary’s multi-family housing market. Excitement is in the air as condo buyers are eagerly anticipating the start of construction on a distinctive new townhome development in northwest Calgary’s scenic Sage Hill. Living at a place where everything is on the same level and well within reach is convenient. Condo buyers eagerly anticipating the start of construction on a distinctive new townhome development in northwest Calgary’s Sage Hill are thrilled to see work is now underway. Fewer Canadians have been taking the plunge into home ownership for the first time in the past few years – and that worries economists studying the national residential real estate market. First-time homebuyers with an eye on northwest Calgary have a new opportunity in Sage Hill. 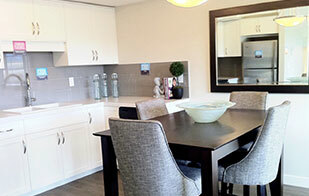 Three show homes recently opened at a condo complex called Sage.Stone. This includes its 1,078- square-foot, two-storey plan, with two generously sized bedrooms on the second floor. The bedrooms share a wall and full bathroom. The bathroom can be accessed from both the second floor hallway and the master bedroom’s rectangle-shaped, walk-in closet. Both bedrooms are bright with natural light thanks to towering windows. The staircase to the main floor curves, and on a split level includes a closet-sized laundry room with a stacked front-facing washer and dryer. This makes carrying a basket of laundry easy, with the laundry room only a few steps from either second-floor bedroom. Like the bedrooms, natural light is a focus with the main-floor design. The front-facing great room features floor-to-ceiling windows — and with its open-concept floor plan, the light rolls across the dining area and kitchen. The openness also offers a space well suited for entertaining. The dining area boasts enough room for a large table, suitable for anything from a casual dinner partyto a holiday feast. The U-shaped kitchen has stainless-steel appliances and an expansive bank of both greenwood painted upper and lower cabinets, perfect for non-perishable groceries and pots and pans. Off the kitchen is a corner nook with a built -in desk. This space works as either a place to dump keys and mail or taking care of unfinished office work or homework. The unit comes with a large patio space off the great room. This creates the perfect place to enjoy the fresh air with a cup of coffee and a novel on a sunny day. 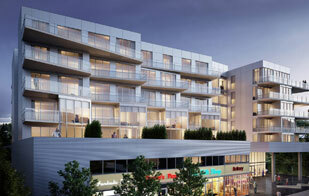 Units at Sage.Stone come in two-storey plans with a garage or a basement and one-storey plans. “We have our first possessions going in,” says Brian Kernick, president of Greenview Developments, which is building the project in the northwest community of Sage Hill. About 60 of the first phase’s 88 units, housed in eight buildings, have sold. He expects sales for Phase 2, with 90 units, will launch sometime in the next few months. The overall plan calls for 178 units in 17 buildings. Sage.Stone offers four kinds of homes. One-storey townhomes, starting from $186,900, come as either main-floor-plus-basement or as upper-floor townhomes. The two-storey townhomes, starting from $226,900, offer a choice between home plus garage or home plus basement. Condo fees are between $110 and $130 per month. 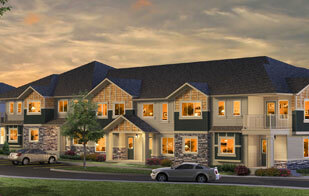 The townhomes range from 821 to 1,078 square feet, each with its own private entrance. Greenview Developments was established in 1992 by president Brian Kernick. The company has experience in development, construction and management of residential housing, along with manufactured housing communities, commercial and hotels. It has built in Canmore, Regina and Fort McMurray. Until now, the company has been most active with new construction in Regina, Fort McMurray and Canmore. As well, it has undertaken renovations of some large projects in various locations in Calgary. But for his first new build in Calgary, Kernick purchased nearly three hectares of land in the city’s active northwest at 144th Ave at Sgae Valley Road N.W, fo his Sage.Stone development – a unique blend of 178 townhouses and apartment condos in 17 buildings. Eight of the buildings, totaling 88 homes, are in the first phase. The number of Homes in each building varies from 8 to 14. “I think, because of the mix and unique design of the townhouses and apartment, that we have come up with something different than your traditional multi-family development,” says Kernick. The apartments are called garden homes and are single-level units built in a two-storey building with main-floor units having a full basement. The townhouses come in two designs – one with a drive-under garage, and the other with no garage but with a basement. The garden homes have two bedrooms and range from 821 to 880 square feet, with prices starting at $179,900 plus GST. The townhouses measure 903 to 1066 square feet, with prices to $247,900 plus GST. Condo fees are expected from $115 to $135 per month, says sales manager Laura Lambert. “Because of the price point, we expect most of our purchasers will be first-time buyers – and so, there has been a lot of interest from single women,” she says. Kernick hopes the project will be in the ground by December or January, with first occupancies in the fall of 2012. “We’re really excited to see construction start in the next few weeks and I know buyers are enthusiastic about it as well,” says Brian Kernick, president of Greenview Developments, which is crafting Sage.Stone, a mix of 178 one and two storey townhomes. “Sales are really going well; we’re 70% sold in our first release, and once customers see construction is underway we expect interest will only continue to grow as new buyers will be able to see the community take shape,” he says. The one storey townhomes are unique in that they offer single level main floor living with a basement or single level living on the second floor, and again each have their own private entrances. 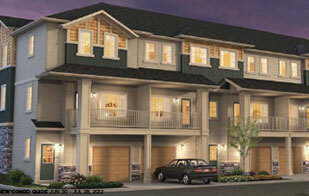 The one storey townhomes are all two bedrooms and range from 821 to 1,203 sq.ft. All home types present stylish, open concept designs with lots of windows to let in plenty of natural light, and floor plans that are functional and comfortable. As well, there are several options available to add half baths, pantries and lower level development to include a family room, bathroom, and additional bedroom. Homebuyers will appreciate the well-appointed interior features and finishing’s such as sleek European-inspired kitchen cabinets, brush chrome hardware, Kohler bathroom fixtures, water saving low flush toilets, and appliance package including fridge, stove, over-the-range microwave with hood fan, dishwasher and in-suite laundry with washer and dryer. The kitchens have different floor plans creating stylish yet functional spaces with nook options, while some master bedrooms have walk-in or walk-through closets to the main bathroom, and all the homes have either a private patio or balcony and come with exclusive-use parking stalls. “What also sets us apart is buyers get to sit down with an interior designer to choose from endless colours and selections for their home,” Kernick says. “They’re not just given two or three colour choices, they have numerous selections available and can truly express themselves and have homes that reflect their personalities, and we give people the opportunity to upgrade to items like granite and hardwood.” The exteriors are esthetically pleasing highlighted by a mix of natural earth tones that blend in well with the prairie landscape of Sage Hill and feature upgraded elements such as Hardie board and cultured stone for a contemporary look. There is a central park space and lots of green space throughout the development, as well as landscaping around the buildings and patios to provide some privacy for homeowners. “We’ll also have benches and pathways around the community and the paths will link up to those in Sage Hill,” Kernick says. This is especially true for downsizing retirees who don’t want to hustle up and down stairs every time they need something – but younger homeowners can appreciate it, too. Buyers with a taste for single-level livings may enjoy a one-storey townhome at Sage.Stone. This is a project by Greenview Developments in the northwest community of Sage Hill, a subdivision master-planned by United Communities. It offers one-storey and two-storey floor plans. One-storey plans come in main storey plus basement or simply upper-storey models. The upper-storey model is 882 square feet. Past a small set of stairs to get from street level to the unit, owners are treated to having everything only a few steps away. Not only is it relatively stairless, but there’s a wall-less design in the main living area. This makes everything feel open and airy, and larger than the actual square footage printed on the floor plan. To the right, there’s spacious rectangular great room with big windows. This includes a glass door that steps out to an expansive balcony. 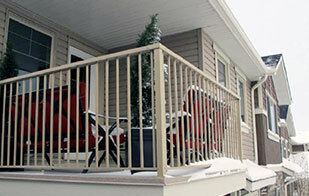 The balcony has more than enough space for chairs and a table, making it perfect for entertaining on a warmer evening. The great room flows to a nook, where there’s plenty of space for a large table. Adjacent to the nook is an L-shaped kitchen. There isn’t an island in the kitchen, but it isn’t missed because there’s a large amount of counter space. The extra space to move around is also a welcome addition, especially when there’s more than one person cooking. The full bathroom is shared, but can also be directly accessed from the master bedroom. This bathroom also links to a linen closet and a utility room, where there’s a stacked front-load washer and dryer. While it’s a two-bedroom plan, this layout would also be a good fit for a single person needing extra space to work from home. In the show home, the second bedroom is staged like a home office. Both bedrooms come with a large closet. Greenview Developments is crafting Sage.Stone that consists of 178 homes that present a mix of housing styles that will appeal to first-time buyers or those looking to downsize and enjoy a maintenance-free lifestyle. “We’re offering townhomes with basements and our garden homes are unique in that they offer single-level main floor living with basements or second floor living, and each have their own private entrances,” says Greenview president Brian Kernick, noting the entrances to the second floor homes are from an exterior entrance as well. “We built similar homes in Regina and have sold more than 300 over the last two years so they are really proving popular,” Kernick says. Kernick says both home types present stylish, open concept designs with lots of windows to let in plenty of natural light,” and floor plans that are functional and comfortable. As well, there are several options available to add half-baths, pantries and lower level development to include a family room, bathroom and additional bedroom. Homebuyers will appreciate the well-appointed interior features and finishings such as sleek European-inspired kitchen cabinets, brush chrome hardware, Kohler bathroom fixtures, water-saving low flush toilets, an appliance package including fridge, stove, over-the-range microwave with hood fan and dishwasher and in-suite laundry with washer and dryer. The kitchens have different floor plans creating stylish yet functional spaces with nook options, while master bedrooms in the townhomes have walk-through closets to the main bathroom and all the homes have either a private patio or balcony and come with exclusive-use parking stalls. The exteriors are esthetically pleasing highlighted by a mix of natural earth tones that blend in well with the prairie landscape of Sage Hill and feature elements such as upgraded vinyl siding, Hardy board and cultured stone for a contemporary look. Sage.Stone’s location is an added attraction being off 144 Avenue N.W. and close to Symon’s Valley Road/Beddington Trail providing quick access to Stony Trail and Deerfoot Trail for ease of getting to the airport, downtown or around the city. Kernick says residents will benefit from the extension of Shaganappi Trail to 144 Avenue, slated for next year, as well as the eventual extension of Sarcee Trail to 144 Avenue. Residents will also be pleased that an array of shops, services and eateries are just moments away in nearby Creekside shopping centre, and a short drive away to CrossIron Mills. As well, a future bus stand is located next to Sage.Stone and a commercial site will be developed in Sage Hill for neighbourhood convenience. “We’re really excited to see the start of construction and that we’re moving forward, and I know buyers are enthusiastic as well,” says Brian Kernick, president of Greenview Developments, which is crafting Sage. Stone, a mix of 178 one- and two-storey townhomes. Sage.Stone offers buyers a distinctive mix of styles in one- and two-storey garden townhomes, with private entrances. “This home style is appealing to first-time buyers as well as those looking to downsize and take advantage of a maintenance-free lifestyle, and people really like the private entrances because it feels more like a single-family home,” Kernick says. The one-storey townhomes are unique in that they offer two designs – single-level, main-floor living with a basement and single-level living on the second-floor – each with their own private entrances. The one-storey townhomes are all two bedrooms and range from 821 to 1,203 sq. ft.
Sage.Stone also offers twostorey, two-bedroom townhomes ranging from 903 to 1,078 sq. ft. that come with either a garage or a basement. Prices start at an amazing $179,900 plus GST. “People love the price; they can get in at $788 a month with just five per cent down,” he says, and buyers are encouraged to visit Sage.Stone’s discovery centre to learn details on a special incentive running only in August for the one-storey, second-floor townhomes. As a benefit, buyers get to sit down with an interior designer to choose from endless colours and selections for their home, allowing them “to truly express themselves and have homes that reflect their personalities. All home types present stylish, open concept designs with lots of windows to let in plenty of natural light, and floor plans that are functional and comfortable. As well, there are several options available to add half-baths, pantries and lower level development to include a family room, bathroom and additional bedroom. Homebuyers will appreciate the well-appointed interior features and finishings such as sleek European-inspired kitchen cabinets, an appliance package that includes fridge, stove, over-the-range microwave with hood fan, dishwasher, washer and dryer, and water-saving low flush toilets. All the homes have a private patio or balcony and come with exclusive-use parking stalls. As a benefit, buyers get to sit down with an interior designer to choose from endless colours and selections for their home, allowing them “to truly express themselves and have homes that reflect their personalities,” Kernick says. The exteriors are esthetically pleasing, highlighted by a mix of natural earth tones that reflect the prairie landscape of Sage Hill, and there is a central park space, green space throughout the development, and landscaping around the buildings and patios. The city's first suburban office park was officially launched Wednesday, with the unveiling of plans for Harbour Landing Business Park, a $60-million, 160,000 square-foot development in southwest Regina. Given its proximity to the Regina International Airport and Global Transportation Hub, its proponents believe it won't be long before the project takes off. "Regina currently has the lowest (office) vacancy rate of all major markets in Canada in both downtown and suburban markets," said Dale Griesser, president of Avison Young Commercial Real Estate (Saskatchewan). "Currently, the vacancy rate in Regina is 2.9 percent. "Regina has been experiencing demand for suburban office space for the past several years, and now we have a development ready to proceed," he told a news conference Wednesday. Located on Parliament Avenue between Lewvan Drive and Harbour Landing Drive, the four, three-storey, 40,000-square-foot buildings will appeal to tenants who want relatively inexpensive office and parking space, Griesser added. "We think Regina really needs more office space, especially suburban, campus-style office space near the airport,'' said Brian Kernick of Greenview Developments of Cochrane, Alta., who is co-developing HLBP with Neil Braun of Oak Park Developments of Calgary. Kernick said Harbour Landing Business Park is "good for tenants with big trucks who don't like going up and down elevators with equipment,'' such as homebuilders, surveyors, oil and gas companies. He added that the additional office space will help the city deal with the economic boom that is occurring in southern Saskatchewan. Richard Jankowski of Avison Young added that vacancy rates in Calgary are much higher than Regina's -- 14 per cent versus less than three per cent. Completion of the first phase of the project is fall 2011, with one or more buildings ready for occupancy, depending on demand. Pending approval of the discretionary use zoning by city council, "we would expect to be in the ground first thing in the spring,'' Griesser said. The health of the first-time homebuyers segment of the residential real estate market is crucial for Canada’s home-builders, and economist told the recent national conference of the Canadian Home Builders’ Association. “I think it’s one of the main, critical pieces evolving, not just in 2013, but as we go forward through the next two or three years in the cycle,” said Peter Norman, chief economist of research, valuation and advisory for Altus Group Economic Consulting. But while the national picture may not be trending upward, Calgary’s local first time homebuyer segment is faring considerably better, said Becky Walters, president of Calgary Real Estate Board. The steady influx of people moving to Calgary for work is making its mark on the market. “We see that impacting our shortage of inventory,” said Walters. Nationally, the “first-time buyer has been largely absent, or at least the demand from the first-time homebuyer has been muted for the past few years, and this continues really to be our number-one concern about the market,” said Norman. In his statement as part of the economic outlook panel at the conference, he attributed the slowdown in first-time home purchases to weakness in the labour market and the lingering effects of the recession among young people. “Layered on top of that in 2013 is a bit more muted demand for the move-up buyer,” said Norman. “In particular, we’re seeing a mild inventory adjustment on the high-rise sector in Canada’s major cities and we’re seeing investor buyers softening out of that market. We’re certainly going to see, going into 2013, principally lower starts starting to show up on the apartment side. 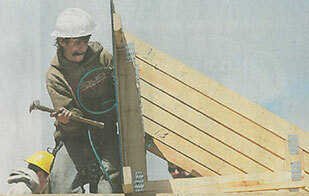 “We’ll probably see pretty steady single-family housing starts going forward in 2013 and 2014. Builders expect 197,000 construction starts of housing of all kinds in 2013, down eight percent from 215,000 starts in 2012. “Signs of demand are showing up, particularly at the sales centre side,” said Norman, based on Altus Group’s survey of builders. With condo units often more affordable than detached single-family houses, condos may be an entry point for more first-time homebuyers in certain locations, such as Toronto or Vancouver, said Mathieu Laberge, deputy chief economist for Canada Mortgage and Housing Corp.
“First-time home buyers are a critical factor when you look at long-term trends for the housing market,” he said. “What we see – based on Statistics Canada scenarios – for the growth rate of first-time home buyers is some moderation coming in the sent seven to ten years. The growth rate is important because it represents future housing demand, said Laberge. “Starting this year, the growth rate (of first-time homebuyers) will moderate (nationally) for the seven to ten years. It will not be as supportive as the last decade,” he predicted. But Calgary’s current situations is a far cry from what first-time homebuyers experienced in the United States in the housing crash a few years ago, said Walters, comparing the two markets. But without the cascading influence of the first-time homebuyer allowing the seller to move up to a larger home, the rest of the residential real estate market risks stagnating. 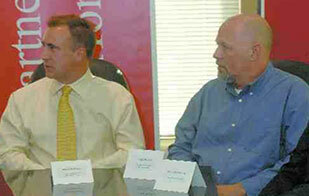 “(First-time homebuyer) have a massive impact on our industry,” said Walters. “You need the equity out of the sale of your first home to that first-time homebuyer to be able to make that first move-up. Maybe in your second or third move-up, you might have built enough equity you might retain one as a revenue property, if you decide you’re a landlord. Calgary builders appreciate the role of the first-time homebuyers – not the least of those builders who sell townhomes, where many people start their home ownership. 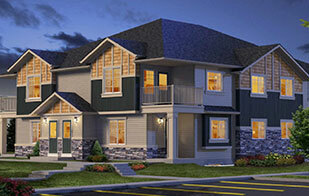 Greenview Developments is building the Sage.Stone townhome complex in the northwest community of Sage Hill. Its one and two bedroom homes start in the mid $180,000s, and attract the attention of many first-time homebuyers. “(First-time homebuyers) are important because they’re driving the economy,” said Brian Kernick, president of Greenview Developments. “A lot of people come here to rent here first, until they get more established, then look at buying instead of renting. They’re certainly important to Alberta’s economy and others’ economy.